After your ID card design is completed, you will want to create a database to store the custom information that will be printed on each identification card. The following video from Datacard provides instructions to create the database storing your unique card information. If you need assistance in locating the best ID card printer, card design software or printing supplies for your photo id needs, contact our ID card experts at Safe-Card ID. They can be reached toll free at 888-485-4696. This entry was posted in Datacard Printer, Video and tagged Datacard Printer, Datacard Video, ID Works Software on February 9, 2012 by SafeCard ID Team. Safe-Card ID is proud to offer Datacard printers and supplies for printing your custom card needs. Please contact our ID card experts toll free at 888-485-4696 for assistance with your Datacard product selection. This entry was posted in Datacard Printer, Video and tagged Datacard Printer, Datacard software, ID works on February 7, 2012 by SafeCard ID Team. When printing ID cards and the PVC cards are placed in the correct position to input into the printer, occasionally a “card is stuck in the print area” error may be given by a Datacard SP series id card printer. When this error displays, the most probable cause for the error is due to dirty cleaning rollers. The cleaning rollers must be sticky enough to grab the card and pull it into the printer. The card may not be grabbed securely enough to clear the card input photocell in time. The card lagging behind may cause the photocell to interpret the situation as a card stuck in the print area, thus displaying that indication. To correct this error, clean the upper and lower cleaning rollers. If the rollers are not sticky after you have cleaned the rollers, then they will need to be replaced for best operation of the Datacard card printers. This entry was posted in Datacard Printer and tagged Card Stuck Error, Datacard Printer, SP Series Printers on December 11, 2008 by SafeCard ID Team. Our Datacard SP35 Plus printer is printing faintly. Any ideas? It sounds like the printhead temperature needs to be increased in the print driver. This will enhance the color and density of the ribbon transfer to the card. 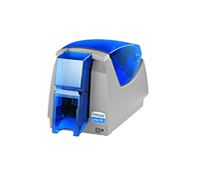 For additional information about the current SP35 Plus or other Datacard printer models, let our id card experts provide you with a free consultation. This entry was posted in Datacard Printer and tagged Datacard Printer, Datacard Support, SP35 Printer on November 26, 2008 by SafeCard ID Team.